In an age in which people increasingly tend to gravitate towards opposite ends of the spectrum in their opinions on just about anything, the great debate the past few years over whether kids under 14 should be allowed to play tackle football is no different. In one corner are those who argue that playing tackle football at an early age comes with such an unacceptably high risk of developing the debilitating neurodegenerative disease, chronic traumatic encephalopathy or CTE, that the time has come to deny parents any say in the matter through an outright ban. In the other corner are those who see the game of tackle football being made safer, almost by the day, who believe that those in the anti-football camp, aided and abetted by many in the mainstream media, have built their arguments on questionable science and on fear. They argue that, despite football’s risks – a risk of CTE which at this point cannot be quantified with any degree of certainty and likely depends on a multitude of factors – it should be up to parents to decide whether to allow their child to play, and, if so, at what age. 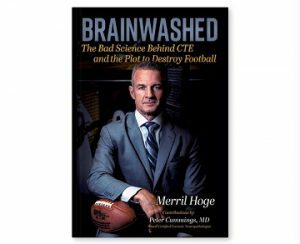 To his credit, Hoge makes it clear, over and over, that he’s not saying it’s good to take repeated impacts to the head, or that he is denying that there are former NFL players who have psychological and neurological problems which can be attributed to playing football. [S]cience done right is a slow process. Because we favor information that confirms our biases, millions of doctors, athletes, parents, coaches, and journalists are making up their minds based on an incomplete picture painted by headlines that are far ahead of the science. That’s leading to conclusions that are harmful and wrong. It’s time we stopped calling people ‘deniers’ and had an open, candid conversation about what’s true. I couldn’t agree more. (And, in doing so, I fully expect that I will, like Hoge and Cummings, take some pretty savage hits on social media from those who believe that any organization that fails to join the call for an immediate end to youth tackle football as we know it in America is, by definition, their sworn enemy). 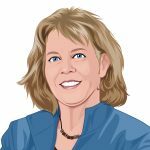 It will also come as no surprise to anyone with at least a passing interest in the debate over CTE that Hoge and Cummings single out for particular criticism the outsized role the BU CTE Center, its celebrity pathologist, Dr. Ann McKee, the BU-affiliated Concussion Legacy Foundation, and their media mouthpiece, The New York Times, have played in shaping the narrative about CTE. But what I found informative and new in the book, and made it worth reading, even for one as steeped in the subject of head injuries in football as I have been for the past eighteen years, was the middle section of the book in which Hoge – with the invaluable assistance of Dr. Cummings – debunks the myth that CTE is settled science, and that football is its cause. In so doing, they raise serious questions worthy of discussion about the validity of a lot of BU’s CTE research, including the degree to which it is marred by selection bias, by what they see as critical flaws in the theory that head trauma inevitably leads to CTE, by the lengths to which BU appears to have gone to maintain control over the CTE=football and CTE=suicide narratives, the degree to which the criteria for diagnosing CTE has largely been determined by BU (especially enlightening was a lengthy section of the book raising the question of whether stage 1 CTE is even a real disease), and the apparent willingness of researchers to conclude that CTE, and CTE alone, is responsible for behavioral changes in athletes found after death to have suffered from CTE, without accounting for, or at least revealing, the existence of other factors that could cause or increase the likelihood of the results they claim are due to CTE. Hoge and Cummings take pains to point out in Brainwashed, as I have for many years, that, if parents decide to let their child play youth football – a decision that is theirs, and not the government’s, to make, they need to be sure beforehand that the program puts their child’s safety first by, among other things, educating coaches, parents, and players about concussions, supplying players properly reconditioned and fitted helmets, teaching players how to tackle without using those helmets, minimizing the amount of full-contract practice time, creating an environment in which players feel safe in honestly reporting concussion symptoms, ensuring that concussions, when they do occur, are managed properly, and prohibiting players from returning to practice and play until a doctor with concussion expertise decides in the exercise of good clinical judgment that their growing brains have been given all the time they need – and then some – to heal. The challenge I face – that all those of us who love, not just the game of football, but all sports and are dedicated to making them safer – is having our message heard. For the most part, as Hoge and Cummings once again remind us, the national media doesn’t seem interested in reporting good news – that there are steps being taken to make football and contact and collision sports such as soccer, lacrosse, and hockey, safer – or in engaging in a discussion of the nuances of the science about head injuries, because it is bad news, scary news, sensational news, black and white news, that sells, and that some depend for their very livelihood on promoting. From my vantage point, having spent countless hours working with youth football communities around the country, from talking with parents, coaches, administrators, athletic trainers, clinicians and academicians, and from becoming educated about the actual facts about the safety of football, I believe that, not only is football a sport worth saving, and that it can be saved, but that those who call for it to simply be abolished represent a minority, albeit an extremely vocal one, which is not above using smear tactics such as bullying, intimidation, and outright defamation in an attempt to get its way. Brainwashed is not without its flaws. In making the pro-football case, the authors, who I have spent time meeting and talking with both before and after the book’s publication, can’t resist the temptation in some instances to respond to the hyperbole on the part of the kill tackle football cabal with hyperbole of their own, and to rely in some cases on questionable research data of their own, which is unfortunate. Purple prose doesn’t help anyone make a reasoned decision on the basis of the facts. But, given the myths which so many in the kill football camp have been perpetrating and perpetuating, it’s no wonder Hoge and Cummings feel like they sometimes have to shout as well. In the end, however, I don’t believe it will be those who scream the loudest, the trolls on social media engaging in the politics of emotion and innuendo, who will prevail. It will be those who discuss the risks and benefits of sports calmly, rationally, and objectively, who work tirelessly to make sports safer, based on science, who will win out.